The Phytobac filter uses soil to clean sprayer rinse water. When the spraying is done and the sprayer is in the yard, farmers and custom applicators face their final challenge: cleaning up the last few gallons of rinse water. In Europe, scientists determined that more than half of the pesticides found in streams started at the fill/rinse pad. Water quality regulations there clamped down hard on rinse water, and the industry responded with an elegant solution—enlisting soil microbes to degrade the last bit of crop protection products in the rinsate, then evaporating the water. Bayer CropScience has spearheaded the development of the Phytobac system, which can be homemade or built of commercially available parts. Rinse water drains into a tank, from which it is pumped into a drip irrigation system that applies it to a roofed box of soil and straw. There, microbes and plants convert chemical residue into harmless molecules while water is evaporated and transpired away. 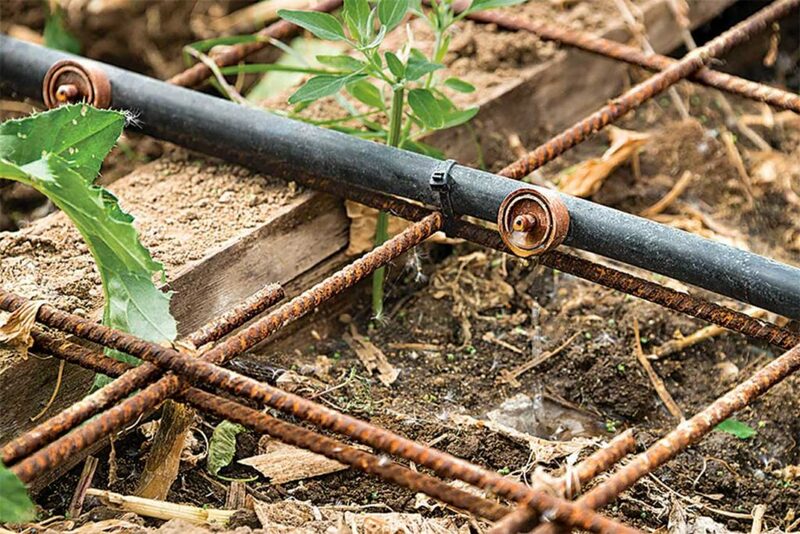 A drip irrigation system applies rinsate to a mix of local soil and straw in a Phytobac. More than 3,000 are in use across Europe. Microbial population. At Bernd Olligs’ farm in western Germany, David Lembrich, Bayer CropScience global product stewardship manager, explains that the secret is in the soil. 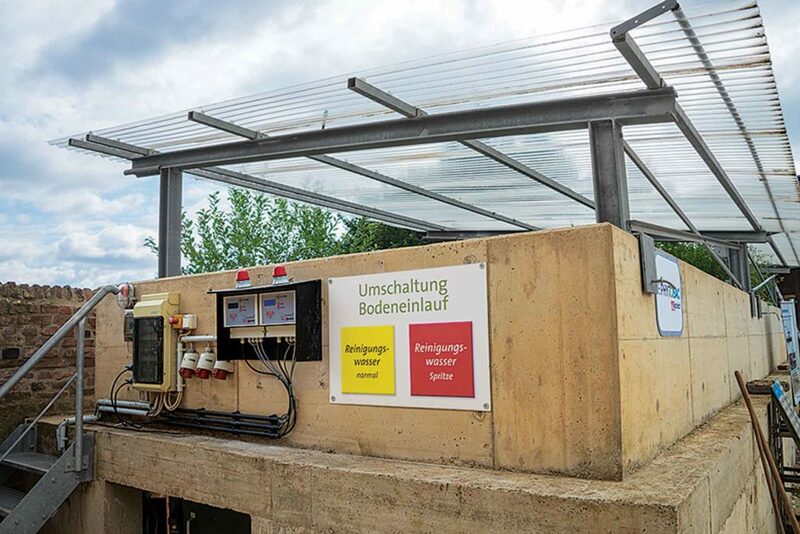 Olligs’ Phytobac, built in 2012, can process about 2,600 gallons of rinsate per year during the German growing season, which lasts 6 to 7 months. That’s also how long it takes to reduce the concentration of most chemicals in rinsate to negligible levels. The bio-bed—a mix of 70% soil and 30% straw in a 40-cubic-yard concrete box—is maintained at 70% of field moisture capacity to keep the microbes happy, healthy, and hungry. This Phytobac treats 2,600 gallons of rinsate per year. Tug of war. It’s a constant tug of war. Tensiometers measure soil moisture at 6 inches deep, helping Olligs maintain proper soil moisture. Meanwhile, a clear roof over the bio-bed raises the soil temperature by 2 to 3 degrees Celsius (3.6 to 5.4 degrees Fahrenheit) and directs wind over the soil surface, accelerating evaporation. Plants draw up moisture through transpiration. “We need temperature and wind enhancing evaporation. That is the engine for losing the liquid,” Lembrich says. Bayer has installed Phytobac systems at its research stations around the world. Farmers can build their own installations with standard construction materials or buy modular systems from Dutch manufacturer Beutech, which has designed and built Phytobacs across Europe and in China, Australia, and Canada. At Beutech Agro’s headquarters in Steenwijk, Sander Koster says system costs can range widely based on size, local climate, and installation cost. Ralph Bagwell, product stewardship manager for Bayer CropScience in the U.S., figures a farm-scale Phytobac would cost around $15,000. David Lembrich of Bayer checks a Phytobac’s bio-bed. Regulatory questions. 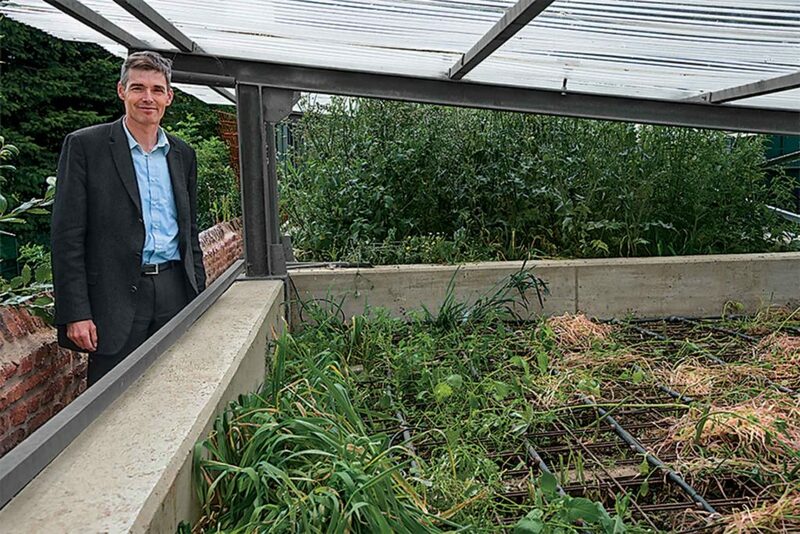 In the Netherlands, Koster says some European governments require a rinsate treatment like the Phytobac. In the U.S., Bagwell says such systems might someday fit into water quality programs, though they don’t yet seem to be on the radar for cost-share funding. Producers want options to control devastating root rot in pea and lentil. Waste potatoes become a spirited second farm income.